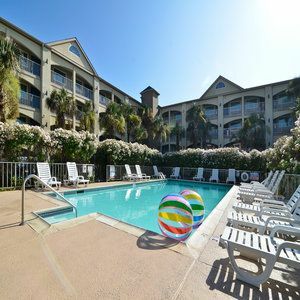 Perfectly situated just steps away from the Galveston Beaches. In the heart of Galveston Islands Strand Historic District and located within walking distance to restaurants and more. This hotels offers a pool, tennis courts, an arcade, children’s play area, fitness center, and luxury spa services. Conveniently located near Moody Gardens, Schlitterbahn Water Park, The Shrine Burn Center and more. This historic Texas city is characterized by warm breezes, year-round temperate seas, rich historic districts, award-winning restaurants, and unique attractions. Don’t just stop at the beaches, enjoy Galveston’s other amazing attractions including the 242 acres of Moody Gardens, Schlitterbahn Galveston Island Waterpark, and the new Galveston Island Historic Pleasure Pier. Please note: flight service for Galveston vacations is into Houston (Hobby), Texas.